January 28, 1547. It is almost midnight, and the cream of English nobility hold their breath as King Henry VIII prepares to face his God. As the royal physicians wring their hands and Archbishop Cranmer gallops through the frigid night, two dispossessed princesses pray for their father’s soul, and a boy, soon to be king, snivels into his velvet sleeve. Time slows, and dread settles around the royal bed, the candles dip, and something stirs in the darkness…something, or someone, has come to tell the king it is time to pay his dues. 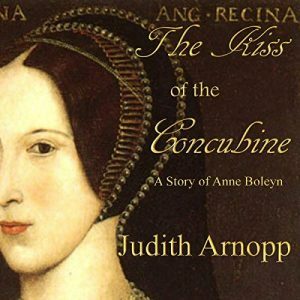 The Kiss of the Concubine is the story of Anne Boleyn, the second of Henry VIII’s queens. “What a refreshing take on probably the most fascinating period of English history and one of its biggest characters. A very believable version of the history and superbly well written. The work seems so much more a personal tale for having been written in the first person. The positioning of Anne as a pawn in the political games of Tudor England carries far greater credibility than some novels from the period which seek to vilify Anne in tune with the way history was written following her demise.